Media coverage is a key element of many businesses’ marketing efforts and mix. News coverage is invaluable in projecting a message to a large audience for branding and reputation-building purposes. Securing media coverage requires time and an investment of resources. The results generated by a PR firm must support branding, assist in building relationships and provide high-value marketing assets which will assist with sales and business development. There also must be a strategy for using media relations assets to achieve business goals and objectives. Many business owners and their teams lack the knowledge and the contacts to successfully launch PR and media relations efforts. They do, however, recognize the importance and tremendous value, including SEO value, of media coverage. For this reason, many business owners need to hire a PR firm. Hiring a PR firm does, however, come with a cost. Therefore decision makers need to be able to make informed choices in this area. Before hiring a PR firm, it is important to understand what should be expected from a firm in terms of service and results. It is also essential to recognize what type of commitment the client must make to ensure success. Below are the important points to consider when hiring a PR firm. 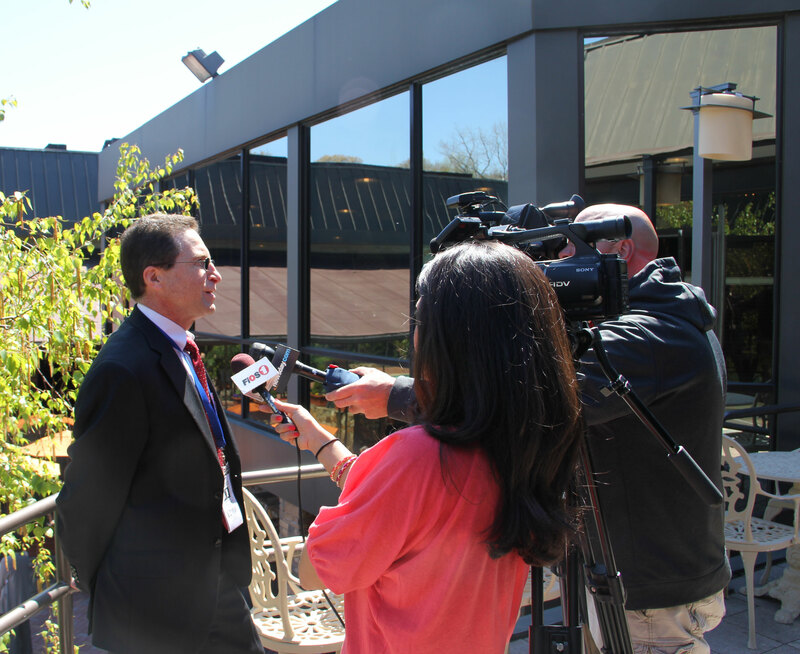 being interviewed by FiOS1 and Newsday at a forum on school security. Watch Out for Promises. Media relations is an important marketing and business growth function Working in media relations is challenging and requires creativity and the commitment of significant time. There are many exceptional professionals in the media relations field, but as in any business sector, there are those who do not maintain high or ethical standards. Media relations is a process and securing media coverage takes work. Beware of any PR “professional” who promises or guarantees coverage. Seek to work with those who can articulate messages, product information and competitive advantage and who will commit to spending the necessary time to develop and bring ideas to the media. If they promise or guarantee coverage, start looking at other firms. Like and Trust the PR Firm Team. Business owners and marketing team members must feel relaxed speaking and interacting with PR firm staff. Being comfortable with the team is essential because confidential information, proprietary strategies as well as personal business and financial information are often discussed. Only individuals that can be trusted should be chosen for this important relationship. Research the Track Record of the PR Firm and its Professionals. Find out how long the firm has been in business, as well as what kind of relationships they have with target media outlets. Ask to see print and video clips of clients in the news. Also request testimonials from satisfied clients as these are a good source of feedback about the company and its team members. Look for a firm that is well established and has a solid track record of success. Search for their clients online and see how media coverage is supporting SEO and their brand. Accessibility is Very Important. A firm that is available any day and any time is ideal. A client needs to know that their chosen PR firm can be reached if they need them, whether it is for positive communication with the media or if there is a crisis situation that requires immediate attention. Today’s 24-hour news cycle and social media require constant and unwavering vigilance. If a PR firm takes a 9-to-5 approach, look elsewhere. and Prostate Cancer Survivor Vince Bucilli. Firm Proactivity is Key. Quality PR firms are always monitoring the media, trends and events that can lead to positive coverage and interviews. Taking a proactive approach demonstrates the firm’s desire to be an active partner and this will provide the greatest return on investment (ROI). Make sure to select a firm that is proactive and not one that will only communicate when ideas for media coverage are presented to them. PR firms should have a process for regularly generating ideas to pitch to the media and clients must agree to be involved. Keep in Mind PR Firm Expertise and Creativity. When choosing a PR firm, ask if the firm will come up with media pitches on their own or if it is a team effort. Media relations professionals understand the media and should be able to quickly develop pitches based on the information provided. Ask if the firm has any experience in specific industries or subject areas. Sometimes it is helpful to have a firm that focuses in a niche or specific industry, while other times firms with a broad reach can serve a client better. Also consider conflicts, if the firm represents more than one business in a sector this could be a problem or possibly a synergy. Relationships and Approaches Matter. Ask the firm about their relationships with members of the media. Do they have contacts with the right media outlets? If they don’t have contacts, ask how they work to get media coverage with new outlets. Ask Who Will be Working on the Account. A number of firms have developed bad reputations for putting inexperienced staff members or even interns in charge of new or small accounts. Before engaging a PR firm, make sure to find out who will be working on the account and their expertise and industry knowledge. Do not let the principal of a PR firm disappear after the engagement is signed. Make sure that the team is experienced and monitor who is doing the work regularly. “Heroes On Our Island,” segment. Ask About Sales Support and Leveraging Coverage. The public relations and media coverage that a business secures becomes a valuable marketing asset that can be used for years. PR firms should provide strategies, approaches and support for the sales and business development team members of their clients. The PR firm needs to use its media relations assets to help secure meetings, build relationships with prospects, start conversations and fill social media streams. When selecting a PR firm, ask how they intend to help amplify the media coverage with social media and how they will help put coverage in front of decision makers, prospects and referral sources. PR Firm Members Must Be Team Players. Ask about the firm’s interest and ability to work with other members of the marketing team. Media coverage is an important part of marketing and the PR firm must be engaged in the process. Firms should recognize the value of media coverage from a social media perspective and explain how it will help with SEO. PR team members should be part of the marketing strategy and relevant planning sessions. Return on Investment and Reporting. Ask what the fees will be up front as well as how they are to be paid. Often firms require a monthly fee or retainer, while other firms will work on projects or for hourly rates. Before hiring a PR firm, set the budget and determine how the firm’s service and PR goals can be achieved within these financial boundaries. Public relations should be looked at as a long-term investment in a brand, product or business. Retaining a PR firm is a decision that requires research and consideration. Speak with people who work with media relations professionals and do research before beginning the search process. Create a budget and select a PR firm that will secure diverse and quality media coverage. The efforts of PR firm should support brand building, attract business and support sales team efforts. Recognize also that PR efforts require time to work and it may take several months before results can be observed. Consider PR firm engagements of six months or more when setting goals and budgets. © 2014 by William "Bill" Corbett, Jr.